There is intelligence running rampant everywhere in Sunday in the Park with George. 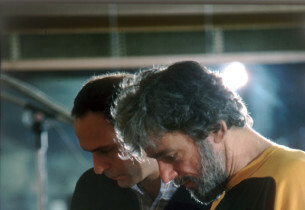 Stephen Sondheim pushed the musical envelope even further with a new creative collaborator, James Lapine, who wrote the book and directed. 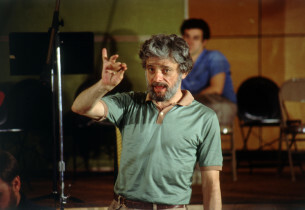 Mr. Sondheim, of course, wrote the music and the lyrics. 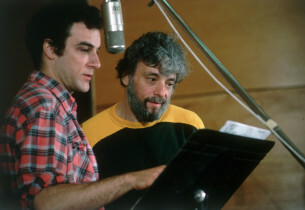 This collaboration of two amazing minds would later continue to bring us incredible works of art with Into the Woods and Passion. 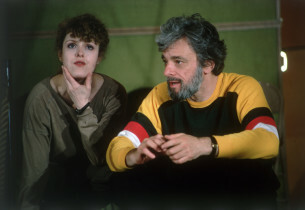 There was genuine excitement in the air, you could feel it throughout the theatre community, when it was first announced that a workshop would be going on at Playwrights Horizons in July, 1983. 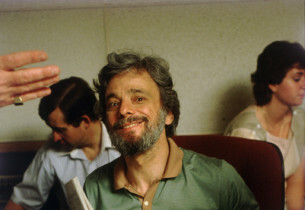 Only Act I of a new Sondheim show would be performed. 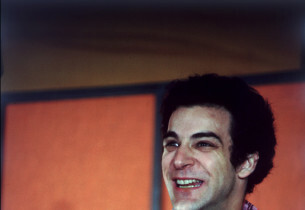 Add to that the news that Mandy Patinkin and Bernadette Peters were participating in the workshop . . . and you had genuine theatre nirvana in the making. No one really knew what it was about, but there was speculation and gossip that it was about “a painting that came to life.” Actually, it was a work of fiction inspired by a painting by Georges Seurat, the 19th-century painter. The painting is entitled “A Sunday Afternoon on the Island of La Grande Jatte” and can be found hanging in the Art Institute of Chicago. You needn’t be familiar with the painting to be swept away by this show, but once you have seen the musical, seeing the painting is a jaw-dropping “MUST.” This only begins to explain the experience . . . the journey one undertakes witnessing this ground-breaking musical. In Stephen Sondheim’s own words: “Order, Design, Tension, Composition, Balance, Light, Harmony.” James Lapine delivered all of these in a staging that not only pulled characters right out of this pointillist masterpiece, but brought to life a story of an artist and his mistress model, Dot. 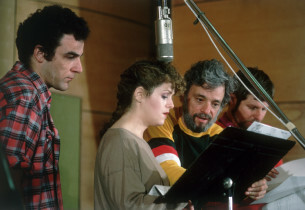 Mr. Sondheim delivered a musically complex, rhythmic, emotional score with lyrics and ideas that “dazzled.” The workshop proved successful enough to decide it would be developed, completed and go into rehearsal for Broadway, starring Mr. Patinkin and Ms. Peters. 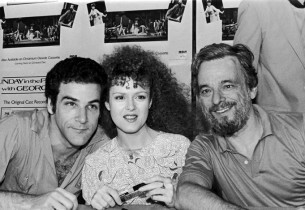 The show opened on Broadway, at the Booth Theatre, on May 2, 1984, after a difficult preview period, which brought changes and additional music and lyrics to the existing piece. It closed 604 performances later, on October 13, 1985. Listening to the show today, knowing the affection professionals have for it, or watching the DVD of the original production, it’s difficult to understand why critics were not so kind to it. 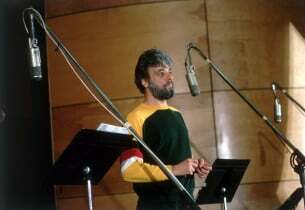 It is so intelligent that to even try to imagine or comprehend how Sondheim and Lapine faced blank sheets of paper, in the same way that George faced that white canvas with “so many possibilities,” is just astonishing. Sunday in the Park with George got nominated for eight Tony Awards® and only won two of them: Best Lighting for Richard Nelson and Best Scenic Design for Tony Straiges. This seems almost impossible to believe, but most of the major awards that year went to La Cage aux Folles. Bernadette Peters would have to wait for Song & Dance to win her first Tony®, although her performances as Dot and Marie were quite extraordinary. 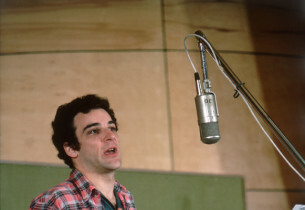 Mandy Patinkin, who had already won a Tony® for his portrayal of Che in Evita, was also mesmerizing to watch and listen to in his dual roles of George and George, the modem “chromolume” artist. 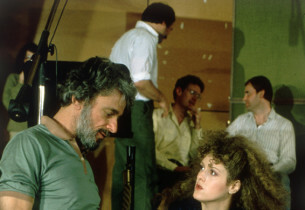 The show did, however, win the 1985 Pulitzer Prize for Drama, a distinction very few musicals in history have received. It also won the New York Drama Critics Circle Award and the Drama Desk Award, both for Best Musical. 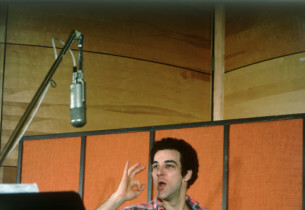 Michael Starobin won a Drama Desk Award for his crisp and moving orchestrations, and Mr. Lapine won Drama Desk Awards for his book and direction, as did Nelson and Straiges. Sunday in the Park with George wouldn’t make it to the London stage until March of 1990, when it opened at the Lyttelton Theatre at the National Theatre London. 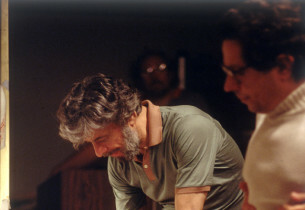 Philip Quast and Maria Friedman were the leads, and it was directed by Scott Pimlott. It won the 199 I Olivier Award for Best Musical. 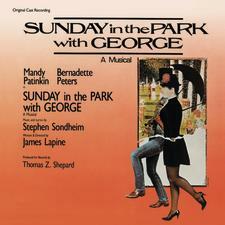 Sunday in the Park with George‘s book and songs seem to go hand in hand in a seamless fashion. Even the opening sequence is dialogue, not music. Very rare for a musical. 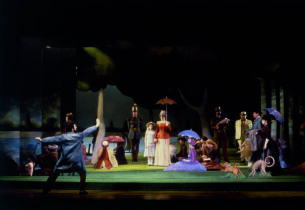 Act I takes place in the park inspired by the famous Seurat painting, on a series of Sundays, between 1884 and 1886. The theme of “order” and “looking for connection, but somehow being disconnected,” are complicated. George is trying to get Dot to stand still as he begins to try to draw her figure on his pad, which he will transfer later to his painting, comprising thousands of dot-like brush strokes. We meet many other visitors to the park (who will also end up in the painting), as well as Louis, the baker, who Dot will eventually run off with, finding security. The tensions between Dot and George the artist are intense and loving. Longing is in the air. So is his passion for his art. She leaves. He doesn’t know she does so while carrying his child. Act II opens where Act I ended, as a tableau of the painting. This becomes more stark and turns into 1984, where another George, the grandson of the daughter Dot gave birth to (Marie), is also an artist of modern sculpture pieces known as “chromolumes.” George brings his grandmother, Marie, in her wheelchair to the stage for the opening ceremony. Lessons are learned. We are taken to “dizzying heights” with ideas expressing “art isn’t easy,” “all we leave behind is ‘Children and Art.’” We are watching the characters cross time and teach painful and beautiful lessons. Marie dies. The modern-day George goes to the island of La Grande Jatte for a chromolume presentation. George sees Dot. They join the now famous promenade of the painting. 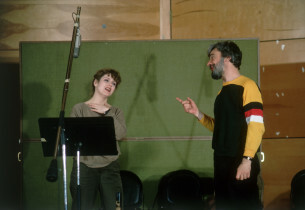 I wanted to talk to Bernadette to try to find out what it was like for her to tackle this musical, her first association with Stephen Sondheim. In 1982, she had come back to New York, from Hollywood, to appear at The Manhattan Theatre Club, in Sally and Marsha. 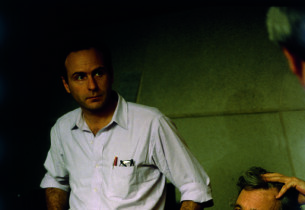 “James Lapine called me to tell me about a workshop he was going to do at Playwrights Horizons. It was only one act and seemed like a safe and artistic atmosphere to work in and a way to find out what the piece was like.” I asked if she had known Stephen prior to this experience. “I think I had met him once, but I was fond of his music and his earlier shows.…I remember Paul Ford and Paul Gemignani teaching me the song “Sunday in the Park with George” and thinking, What have you gotten yourself into?” She laughs. “Then I went in and sang it for Steve. It was a little scary, but what I loved about his writing was that he writes for character.” I asked about the difficulty of wrapping her lips around all those lyrics and time signatures. She told me a funny story about a performance during the Broadway preview where she totally went up on the lyrics of “Sunday . . .” but “never stopped singing and just made the stuff up, staying in the rhythm and tempo of the song.…I couldn’t believe it and still have no idea what I sang!” Bernadette also loved that cast. A cast that included Brent Spiner (pre-Star Trek: The Next Generation), Dana Ivey, in a rare appearance in a musical, Charles Kimbrough (pre-Murphy Brown) and a group of top-notch musical theater actors. During her run in Song & Dance she had the rare experience of being able to walk down 45th Street, from the Royale Theatre to the Booth, to do the video recording of the show, reuniting her with her cast. I then jumped to the topic of the 10th Anniversary benefit performance for Friends in Deed, reuniting the cast for one memorable performance. “I remember it as a perfect night. Perfect harmony. It felt very healing. Very right. I remember looking at Mandy, ten years later. 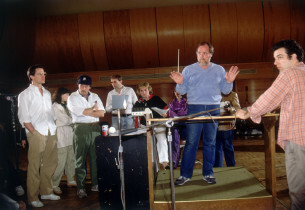 Just wonderful and an opportunity you don’t get very often … to re-visit something you did before and live it again, informed in a different way.” This recording of the original Broadway cast captures the show beautifully. The details and enhanced quality of this remastered recording bring this exceptional musical to the vivid life that Georges Seurat brought to that painting that inspired this sparkling piece of musical theater and musical theater history.